Lovely to look at!! 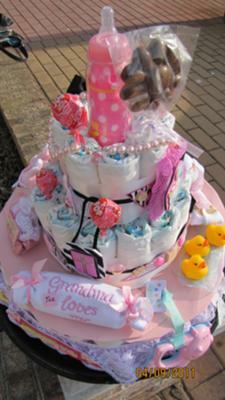 Take a long look at Roxanne's Scrapbooked diaper cake and you'll be filled with a good dose of creativity and class. I love it! It is adorned with perfect touches of baby embellishments and elegant adornments - the pearl necklace and chocolate flower pop are my favorite! We love posting awesome ideas from our wonderful readers! 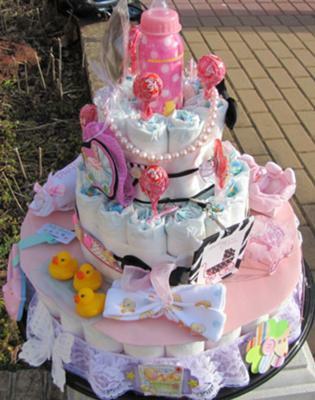 Thousands of our readers are looking for diaper cake ideas and creativity and for every new diaper cake we post, we know that it is viewed and appreciated by all! 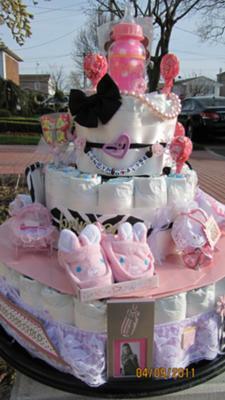 Thanks Roxanne for paying it forward with your gorgeous diaper cake! 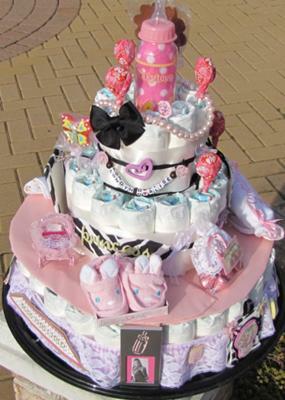 If you have a diaper cake to share, we would love to post it! Send it on over to us right here! 3 tier cake made from 91 16-28 lb diapers & decorated with my scrapbook supplies & a few purchases like rubber duckies, rattle, baby bottle, bib, hat & slippers, photo frame, pearl necklace, TootsieRoll Pops & flower chocolate pop made by me...all for the love of my girl Chynna Doll!